If there’s one thing a lot of modern warehouses and storage facilities lack these days, it’s security. There’s always ways to make your products more secure and keep your workers safe from harm and your inventory free from damage or loss, even if your warehouse has already taken steps towards security by adding cameras or locking industrial doors. Easy installation and maintenance. Much like warehouse mezzanines, wire partitions are a great way to increase the storage capabilities of your warehouse without a costly move or renovation. Every partition is modular and can be ordered in a few different configurations to best meet your storage needs as well as the layout of your warehouse. Secure storage for sensitive products. It might be a little obvious sounding, but above and beyond storing products with a high monetary value, wire partitions are a great way to store more delicate or sensitive products. Use them in combination with medical shelving to store medicine or chemicals that can’t come in contact with other medicine or other surfaces to avoid contamination, or use them to keep chemicals like cleaning supplies or flammable gases & fuels far away from anything that might cause damage or a fire. Protection for costly equipment. In a lot of cases, wire partitions are used as secure storage for heavier equipment and machinery like forklifts or pallet trucks. Having this sort of divided storage gives your heavy machinery a safe place to be parked at the end of the night and may help mitigate any damage that results in costly repairs. Protection for employees. Using secured wire storage around potentially hazardous machinery or supplies can also help reduce the risk of injury to your workers. 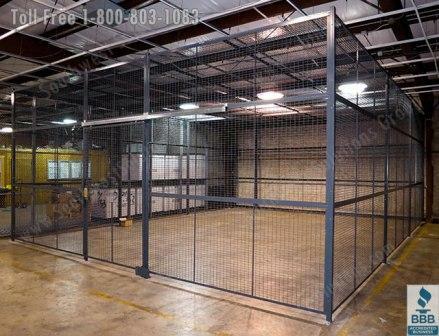 Wire partitions can help keep your dangerous machinery in a separate area only available to workers properly trained in its usage to help reduce the chance of damage or injury, and by keeping dangerous chemicals stored away (as mentioned above) you can prevent chemical burns, fires, and more. Allows for extra space. Of course, these partitions don’t just have to be used for storage. If you need to create an extra room for something like meetings or employee breaks, these partitions can be set up quickly and affordably to allow for an extra room off the main shop floor for whatever you need them for. 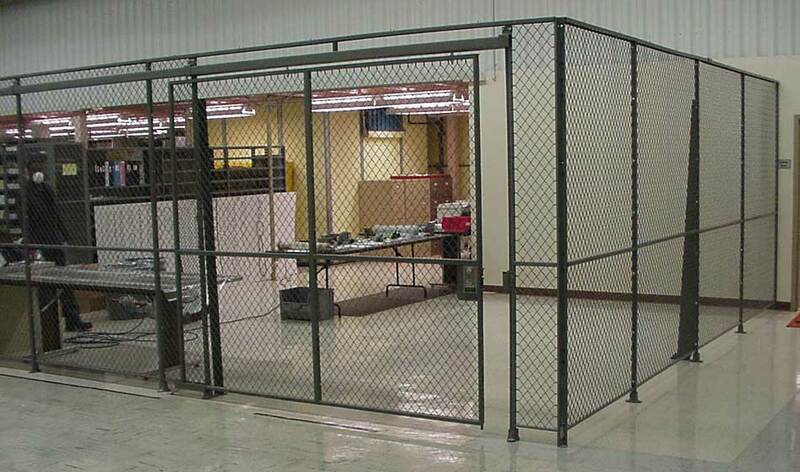 Set up one of these with some break tables and chairs and your employees will thank you!